sayhellotobaby | A first time mum's journey into the unknown! A first time mum's journey into the unknown! I could waffle and waffle about Tenby for days – I love the place! I had never been to Tenby before our holiday this year, but it reminded me so much of some of the lovely seaside places where I spend much of my Summer holidays as a child. Unlike some seaside resorts, which have unfortunately become rundown over the years, Tenby still retains a lot of its charm, and has a lot of character to it which is still so appealing to tourists. With the town walls and the colour-washed buildings, I would almost say it has a meditteranean vibe going on – I think the weather helped of course, I probably wouldnt have the same opinion if I had been there on a rainy, autumnal day! There’s a lot to appeal to all kinds of visitors – out of season it seems pretty peaceful so I’m sure it attracts a lot of the older generation, however it definitely feels like a very family-friendly resort, with lovely safe beaches, ideal for getting the bucket and spade out! There’s public toilets and a baby-changing room right next door to the main beach – great for getting all that sand out of our baby’s nappy! Just around the corner from the main town beach – tucked away under the arches of the harbour wall is a lovely little coffee shop called Stowaways – please visit if you get the chance. It’s a tiny little place, blink and you’ll miss it, but the coffee is amazing and it’s run by the friendliest guy in the world! He couldn’t have been more accommodating with E and treated her like a little princess (he has children the same age) and he was just a wonderful character to talk to. We could have spent hours in their, it was so interesting! Later in the day we ate in the Ocean Restaurant overlooking the harbour. Again, a very unassuming, run-of-the-mill Italian restaurant but the staff couldn’t have been more friendly. We’d attempted to have lunch in a pub a few doors down the road, but we found the staff so rude that that we got up and walked out before we even ordered! The staff at the Ocean were by contrast, extremely helpful to us, going so far as to help us choose off the menu for our fussy-eater – and when the meal arrived, she scoffed the lot! When we came back to Tenby a few days later, we grabbed some fish and chips from Fecci’s which is a well-known traditional italian takeaway situated just within the town walls. We sat on a bench along the seafront and enjoyed them as they should be – they were amazing – just watch out for the pesky, giant seagulls! Top Tip: Parking in Tenby can be quite expensive if you’re there for the entire day, but if you arrive early enough there are quite a few places for free on-street parking at the top of the hill above North Beach. It’s only around a ten-minute stroll into the town from there, and the views on the way in are lovely! It certainly was tiny – the main high street has a handful of shops and restaurants and we walked up and down it in around two minutes! However, the main reasons that people head to St David’s is for the magnificent cathedral and for the stunning Pembrokeshire coastline. I do love small cathedral cities – we had a fantastic break to Wells a few years ago and St David’s has a similar feel, although the Welsh city is much, much smaller and peaceful. It was pretty easy to manouevre the buggy around the cathedral walls, though do be careful as there are steps in some areas and other places are a little bit hilly. It’s relatively quiet of traffic near the cathedral – we parked in a small car park just on the edge of the grounds, however apart from this there weren’t many cars around so felt quite safe walking around the narrow lanes. Back up on the high street, we went to The Sound Cafe where we had a fairly decent all-day breakfast, with yummy welsh sausages. The service wasn’t exactly the best, but it was cheap and tasty with a nice outdoor seating area to enjoy the weather so I can’t complain too much. Afterwards we popped across the street to Gianni’s Ice Cream parlour for a lovely ice cream (we came back a few days later for another one!) and then sat on the benches by the War Memorial watching the world go by – albeit a very small world! There isn’t a lot to do in St David’s – particularly to keep kids occupied – unless you’re using it as a starting point for one of the many boat trips on offer, so I wouldn’t suggest spending a whole day here. It is a stunning place just to have a little wander and while away a couple of hours. Have you ever been to Bluestone? I suppose it’s a little bit like Centre Parcs, just a bit on the smaller side! And it’s really geared up for toddlers so if you have small children it might be one for your list. I’d heard quite a bit about it before we went to Pembrokeshire from some friends and had initially considered it as a place to stay for our break, but being on a budget prices were a little expensive for what we wanted (although it’s still waaaay cheaper than Centre Parcs!) Our holiday cottage worked out much cheaper so that’s the option we went with! However, only being a few miles away from the resort we decided to head over to Bluestone for a few hours and use their waterpark facilities – The Blue Lagoon. There are no charges for Bluestone guests as it’s included in the cost of your holiday but they allow the public to use the pool for a charge. Tickets can be quite expensive in high-season, but as we were there out of season, it wasn’t too expensive. It was around £7 each for adults, and £2.50 for under-4s, but this did include a swim nappy too, a nice touch, particularly as we hadn’t taken any with us on holiday. Your ticket gives you three hours of fun in the ‘waterpark’ – a term I use loosely, as to many people it won’t hold the excitement that some of the larger waterparks do, but for us it was ideal. There’s a decent sized pool (although I imagine in high season it can get REALLY crowded), a lazy river which takes you around the pool and outside into the bracing air, two or three waterslides (we didn’t use them but they looked fun), and a couple of smaller pools at the side – one with a pirate galleon and water fountains, and the other a really shallow toddler pool – which we obviously spent most of our time in! Oh, and by the way – if you lose your glasses in the lazy river (J had the unfortunate experience of a water cannon shooting him in the back of the head and firing his glasses into the pool!) the lovely lifeguards will turn off the flow and help you spot them under the water! Thanfully we got them back and normal service was resumed! We really enjoyed being in the main pool – it has a shallow end which gradually gets deeper (like a beach) and every 15-20 minutes a siren goes off, signalling the start of the waves. At this point I usually descended into the deep end and relived my teenage Summers spent in Rhyl Sun Centre whilst E and her daddy sat on the beach letting the gentler waves break over them. E loved it! The toddler pool was brilliant too – it’s fenced off from the other areas, and has it’s own lifeguard (bless) and has various water features for the little ones to play with, including some cute little rock pools for them to explore. There’s a poolside cafe too if you need refreshments but I can’t say whether or not it was good as we didn’t use it. I found that three hours was probably the right amount of time for us – I probably could have stayed longer and I’m sure it may be hard to drag older kids away. But then I guess that’s the beauty of staying on-site at Bluestone is that you can use the facilities as much as you like. A tip for non-staying visitors like us: Head to the Blue Lagoon on a Monday morning or Friday afternoon. These are the main arrival/check-out times for guests so everyone staying at the resort will be pre-occupied either packing or unpacking, leaving the pool really quiet. I don’t know how much we would have enjoyed it had it have been so busy, particularly with E being so small so I really appreciated how quiet it was! Who doesn’t love a day out to see the animals? Wherever we go – even before we had E – we’d always go to the local animal attraction and this holiday wasn’t any different. We knew about Folly Farm prior to our holiday because E’s cousins, a few years older in age and who live in Wales, always choose it as the destination for their special birthday day out. It’s always been a bit too far for us to attend in just a day, so we made sure it was on the list of places to visit whilst we were staying in the area. Folly Farm is situated in Begelly, in Pembrokeshire and is approx. 11 miles from Haverfordwest. It’s only a relatively small zoo (we live near Chester Zoo, so there’s no comparison) but actually for the size there is loads to see and do. It was perfect for E – sometimes I find Chester Zoo can be a bit overwhelming for really small children with so much to take in, but this felt just right. When we first went in we went to the farmyard area and petting area – this was definitely our favourite bit. There were a variety of farm animals (including miniature horses which are my favourite), as well as smaller domestic animals such as rabbits and ferrets. Throughout the day there were demonstrations from the staff where kids (and big kids) were allowed to hold or feed the animals. We got there just in time for the rabbit demo so we took E for her first experience of the furry little creatures. She wasn’t overly impressed but I was excited! Outside there are some impressive animals – I wasn’t expecting to see penguins, giraffe or lions in the zoo but the enclosures are pretty expansive and it’s really good to see the zoo doing their part in the conservation of endangered species. It wasn’t a very crowded day so it felt like there was a lot of space in the zoo so it was really enjoyable to walk round and spend time learning about the different species – again, there are lots of keeper talks and demos throughout the day making it a really interactive experience for the little ones. If your kids have had enough of the animals (I really hope E learns to love them as much as we do) there are lots of other activities on-site to keep them occupied – pretty useful if it starts raining as well as some of them are indoors. There’s a large indoor adventure playground which looked pretty cool – the cost of this is included in the main ticket price I think. There’s also a go-karting track and mini-diggers which there is an extra charge for. There are also little tiny diggers for babies and toddlers which are free and E absolutely loved! The main attraction at Folly Farm – aside from the animals of course – is the Vintage Funfair. It’s the sort of place that if you were there alone at night, it’d be the creepiest place in the world – however in the day, it’s vibrant, noisy and just a little bit crazy – but I’m sure the kids love it! When we first went in, it was a little bit TOO much with all the various ride noises all going off at the same time, but once you got used to it, it was pretty cool. I love retro fair rides like the dodgems and the carousel with the galloping horses. I don’t have much of a head for heights, but of you do there’s even a vintage ferris wheel outside to give you a birds eye view of the park. E was a little bit too young to go on anything this time but I definitely want to take her back when she’s a little older. It’s the sort of funfair I grew up with as a child and I’d love for her to experience the same thing. I know we live in a hi-tech world these days, but the simplicity of these rides are just wonderful. Last but not least, we managed to grab a ride on the land train before we went home. We only just discovered it on the way back to the car, and I’m so glad we did. Again, its another activity that’s included in your ticket price – and basically its just a few trailers pulled along by a huge tractor, taking you around the farm area of the park. E thought this was fantastic and was waving at all the animals as we went past – it was the best thing ever to see her face, although I actually think she was more excited over the tractor than any of the pigs or sheep that we saw. She’s definitely a petrolhead like her daddy! All in all, I’d totally recommend a day out to Folly Farm – we were there for a good few hours, but if E was a little bit older I think we’d have been there all day. We had lovely weather so were able to appreciate every little bit of the zoo outside, but there’s definitely enough to keep everyone occupied indoors in case the heavens open. Ticket prices are pretty reasonable considering all the activities that are included – we actually used our Tesco Clubcard vouchers to get money off entrance so to us it was even more of a bargain! Last month we spent a lovely week in Pembrokeshire. Despite it being somewhere that I’ve always looked at and thought how beautiful it looked, it’s never really been on our radar as a holiday destination. The main reason being that we already spend a LOT of time in Wales due to family living there and although it’s a different area – it has always seemed to close for a holiday. However after an extremely stressful trip to the south coast last year and an epic 10 hour car journey with a teething baby, a holiday only a short distance away was sounding more and more like my cup of tea. From home to holiday, it was around a three hour journey so perfectly acceptable travelling time with a little one on board. We booked a lovely self-catering cottage just outside Haverfordwest. It was located down a few windy country lanes so definitely one to avoid if you’re relying on public transport but as we had the car it was perfect. We booked the cottage on looks, budget and of course whether or not it was family-friendly, we weren’t too bothered about the location but as it turned out it was ideal – it’s pretty much right in the heart of the county so everywhere we wanted to visit was never more than about 10-15 miles away, plus Haverfordwest itself had a decent range of shops including a giant Tesco, Aldi and an M&S for our holiday treats! Weather-wise we couldn’t have picked a better week – probably the best week we had all Summer so we had a great time exploring many of the beaches in Pembrokeshire. Although it was beautiful weather, there were occasions when we had the place pretty much to ourselves – the joys of having a child that’s not of school age and can go out of season! We were disappointed not to see some of the beaches – E isn’t quite walking yet and some of the more spectacular of beaches along the Pembrokeshire coast are only accessible by long walks or steep climbs – not ideal with a buggy. We do have the sling of course, but she’s just getting a little bit too heavy for back-breaking treks! Also, some of the beaches are managed by the National Trust and operate car parks with a £5 charge. We wouldn’t resent paying if we were planning a day of it, but that’s not going to happen with the attention span of a 1 year old! Instead we decided to save the beauty spots for another occasion when E is older – and more steady on her own two feet – and opted to go for the beaches with easy access and with free (or very cheap) parking! Broad Haven was probably our favourite beach spot – not least because we were the only three people on it! It was lovely – such a broad (obviously) expanse of sand, which was clean and flat with no shingles so you could walk all the way to the sea completely barefoot without uttering all the swear words under the sun. E loved being on the beach – it was a shame she’s not walking as it would have been lovely to have her toddling on the sand here. Instead she just treated it like a giant sand pit as well as consuming a good few mouthfuls of it. She’ll eat anything this child. We visited lots of other places during our stay – including St. Davids, Tenby, Folly Farm and Bluestone – they all deserve a post of their own so I’ll be writing about these over the next few days. We always like to have quite a full itinerary on our holidays and Pembrokeshire certainly ticked all the boxes when it came to offering lots of interesting days out. It’s definitely on our list of ‘places to go back to’ – although the thing with us, is that we’ve never been back to the same place twice. When it was just the two of us we wanted to explore lots of different places while we had the chance, but now we have E our holidays are different and the focus is mostly on her enjoyment, as well as ours. So the likelihood is that we will return here as it’s definitely a family-friendly destination and one that I think she’ll enjoy more and more in years to come. 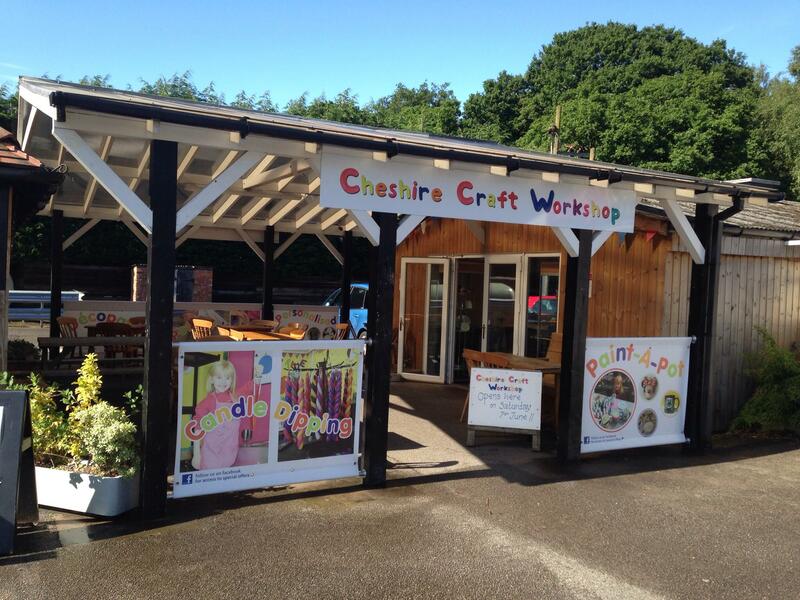 I’ve known about Cheshire Craft Workshop for years but despite being a crafty person, I’ve never actually been. However, a few months ago, I was fortunate enough to win some vouchers which meant I had to take a trip and it seemed like a fun day out for E and myself! The workshop is based at Blakemere Village, near to Northwich in Cheshire. The village has a number of warehouse/barn type buildings housing different retail outlets -various little gift shops selling homemade crafts, such as cards and jewellery, garden accessories, baby clothing, vintagewear, film memorabilia – it’s all a bit random really. There’s also a restaurant, tearoom, children’s playbarn, falconry centre, segway track, mini golf, an outdoor playground and a miniature railway that runs at the weekend. The workshop itself is set near to the back of the centre – I went during the week, quite early in the morning and the place was pretty deserted. When I went to the door of the workshop I wasn’t even sure whether it was open (I drove 20 odd miles without booking so it would have been pretty annoying if it was shut) but thankfully it was! I opened the door and headed to the counter, when a MASSIVE alsation came out of the back, heading towards us and barking! Those who know me well understand my fear of dogs (big and small) so to be confronted by this, in an empty warehouse, well and truly freaked me out. I gasped loudly and turned the buggy away from the dog, instinctively protecting E, whilst I fully expected to be mauled by this beast of a dog. Thankfully I heard a friendly voice, calling the dog back and that was when I noticed that it was actually behind a baby gate anyway. I tried to act all nonchalant after that, like it hadn’t bothered me, but it wasn’t the start to the morning I wanted! The dog is was really very lovely, and is a big softy, so thankfully the rest of the morning only got better! Firstly you choose your activity – mainly its painting a piece of ceramic, however I think if you have pre-booked there is a potters wheel, clay imprinting and candle making. For the painting, you choose your piece of ceramic – there’s loads to choose from including plates, cups, money boxes, frames, plant pots etc. Average cost seems to be around £15-20 per piece, although there were smaller items which were cheaper such as coasters. I chose a moneybox (for us) and a plant pot (for E’s Granny and Grandad) which came to a total of £30 (paid for with my vouchers). Once you’ve paid for the items at the counter (and arranged a time when you are able to pick them up), you are free to paint them as you see fit! The fun part! You’re given a table on which there is a selection of paints in all sorts of colours (including some glitter paints) – they’re all non-toxic and suitable from birth, so I wasn’t overly disturbed when E tried to eat them (it was inevitable!). There’s also the brushes, a pot of water, a sponge (for mistakes!) and tissue to clean up with. Everyone is provided with an apron – in kids sizes too. Erika had to sit in a highchair of course, which didn’t bode well in regards to thinking that the paint was for eating, but we managed to keep ingestion to a minimum. The clean brushes were tasty too apparently, but at least this kept her entertained while I created the finer details on our creations. Well I say finer…. what I really mean is a few random splodges here and there! The main thing I wanted to do was to capture E’s handprints in paint – I’ve really only ever managed to capture her footprints at home, handprints have usually ended up on her face, my face, the floor, the sofa – anywhere except the piece of card that they’re supposed to! I was glad to be told that the paint will wipe off with a wet sponge if we were to go wrong, but it appears that all the stars had aligned right at that moment and we managed to capture 8 perfect handprints with ease! E seemed to finally understand the concept of having her hand-painted and then pressing it down flat onto a surface. There was the odd moment she tried to lick it, but we managed it all the same – I was impressed and I think the lady who worked there was too! Then I had to free reign to decorate the rest of it – however that’s where my imagination decided to get up and leave! Some nice words for the grandparents, a few splodges later and we were pretty much done. I really enjoyed the craft workshop – despite my terrifying encounter with the jaws of death (just kidding!) – and would absolutely love to go back. I think E enjoyed it – she probably loved the experience of being able to get messy with Mummy, without me being overly OCD about getting paint on the furniture! It’s definitely a place I’d love to take her to when she’s that little bit older and understands the concept of painting with a brush as opposed to eating one. I think as a kids party idea it’s brilliant – messy but brilliant. They do adults parties too, and I’ve just found out that they do late night specials once a month where you can take your own food and alcohol – now that I would love to do, although I’m not sure what the results would be after a bottle or two of wine! I’m definitely going to mention it to the girls and see if they fancy trying it though! Without a baby in tow, I reckon my creative juices would flow more easily and I can finally create my masterpiece. Or a few more drunken splodges. Whatever…. The Truth Is… I am (not) Iron (wo)Man! I’m sure someone once sang the line “I’m sick and tired…of being sick and tired”. Following my previous post It’s been a while, even more time has passed. Unfortunately my illnesses just got worse. The final straw came mid-March when I was poorly over the weekend of E’s first birthday – I just about managed to hold it together for her party (which was actually wonderful) but over the next couple of weeks I was absolutely dreadful – I hadn’t felt that ill for a long long time. Everything hit at once – flu, gastroenteritis, more tonsillitis… It was not a good place to be and I decided to seek help. I should have done it sooner, but I just thought I was being unlucky… A conversation with the pharmacist (I think they know me by name there now 😉) made me realise it was probably something a little more serious. So off to the doctor I went, and ordered some blood tests. I was tested for all sorts but the results showed that I had iron-deficiency anaemia and something else to do with my immunoglobulins so basically my immune system was non-existent. Its was actually a relief to find out that there was something wrong and that hopefully it could be fixed. 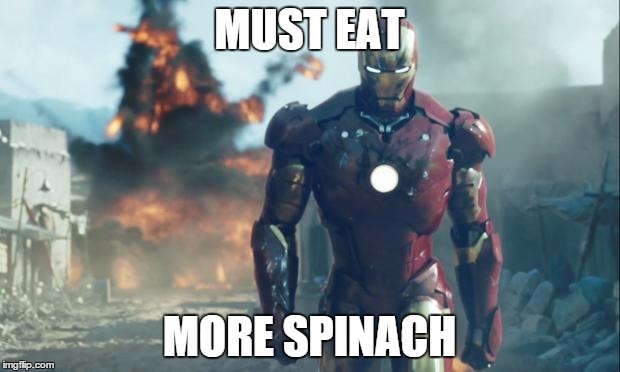 I’ve been taking iron supplements and trying to improve my diet and I’m being monitored with regular tests to keep on top of it. I’m not completely out of the water yet but I am certainly on the mind, and even the psychological effect of knowing what the issue is has been a weight off my shoulders. I’m trying to resume normal service as much as possible so that means more blog posts (yay!) and my business is back up and running! I’ve got so much to catch up on!! The Truth Is…… on It’s been a while!